Lindsey R. Morvant began working with the Lafourche Parish Clerk of Court on January 2, 2014. As a Deputy Clerk in the Conveyance and Mortgage Department, she is responsible for researching and preparing Mortgage Certificates, Property Bonds, and Clear Lien Certificates. She also helps with recording, entering and pricing Uniform Commercial Code forms, and posting marginal entries. Lindsey enjoys spending time with friends and family. She currently resides in Chackbay, LA with her fiancé, Ben, and their 2 children, Brennon (4 years old) and Caroline (3 months old). 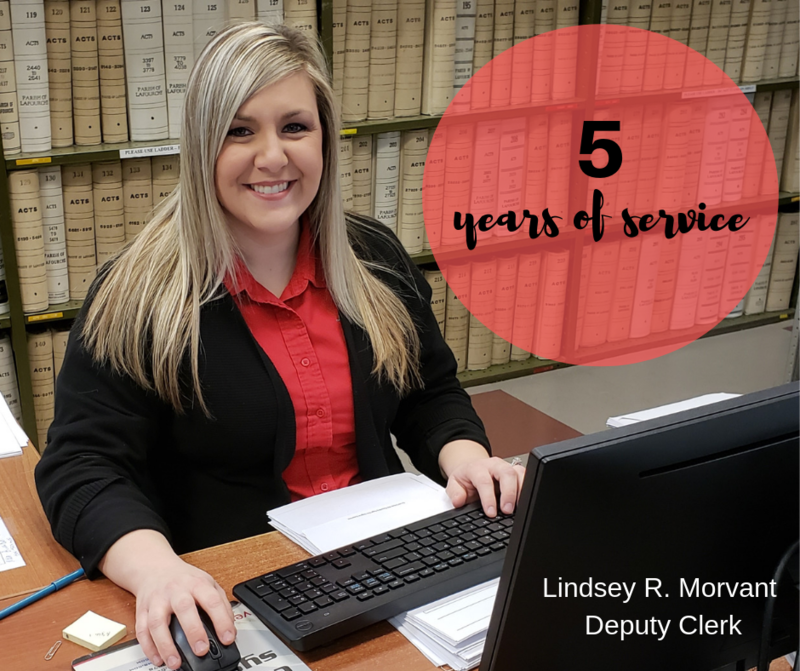 Thank you for your dedication to the Lafourche Parish Clerk of Court’s office and congratulations on celebrating 5 years of service.